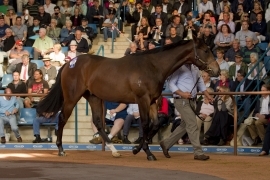 A new Australasian record price for a yearling was set in Sydney on Tuesday when Black Caviar’s half-brother by Redoute’s Choice was sold for A$5 million as Lot 131 at the 2013 Inglis Australian Easter Yearling Sale. Bidding on the star colt opened at $2million, before quickly jumping up in $500,000 increments to $4 million. Three different parties then traded $100,000 bids up to the final price of $5 million. Offered by Three Bridges Thoroughbreds on behalf of breeder Rick Jamieson’s Gilgai Farm, the colt was bought by BC3 Thoroughbreds, which had purchased his sister Belle Couture for $2.6 million at the Easter Sale twelve months ago. “As soon as Belle Couture started to show us that she wasn’t going to let the family down and that she might be pretty special herself we started to think we better have a look at this colt,” said BC3 Chairman Bill Vlahos. “We had a bit of inside knowledge so thought we might have to use that and when John Brockleback comes back and say’s it’s the best yearling he has ever seen we got a bit excited. “John has a great eye and he said has never seen a better yearling here or in the United States,” said Vlahos. The Helsinge colt will now go back to BC3’s property in Victoria, where he will be spelled before being put through the BC3 breaking and pre-training regime, like Belle Couture was. “He’s a young man trapped in in a man’s body. He’s one of the most outstanding looking yearlings you are ever going to see,” said BC3’s Simon Marshall. “He’s very typical of the family, in that he has plenty of growing to do. He’s going to put his hand up when he’s fully matured,” Marshall added. Bill and Simon advised that there will be opportunity for people to get involved in the colt, with a few small 5% shares available to select clients. “We still need to talk to Rick [Jamieson about retaining an interest] and we have left a little bit so that people can jump in. As a stallion prospect we’d like to keep it manageable to 10 or 12 owners,” added Vlahos. The colt’s breeder Rick Jamieson was thrilled with today’s result. “It has been a stressful few months leading up to the sale, but I’m really looking forward to sitting down and having a beer with BC3, Meaghan, Peter Liston and the whole team that worked tirelessly to get to today’s result,” said Jamieson. Photos of the star colt are available on Inglis’ Facebook page InglisBloodstock.